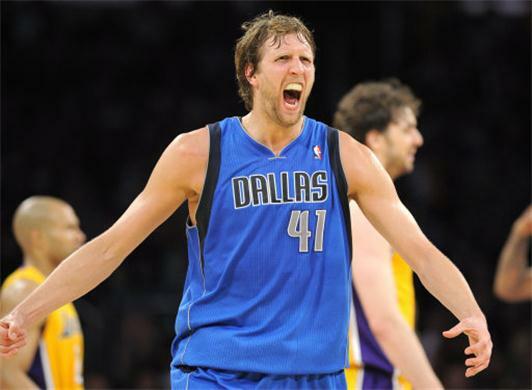 Dirk Nowitzki and the Dallas Mavericks are 18 seconds of game time (approximately 13 minutes of real time!) away from winning their well-deserved and elusive championship rings. I have not seen one second of it. And this season has been more engrossing than most. ‘The Decision’ – Lebron James’ infantile public dislocation from Cleveland to Miami rightfully earned/earns him and his teammates the scorn of the basketball universe. My Lakers were (unsuccessfully) aiming for their third straight run to the Finals and Kobe’s 6th ring, matching Michael Jordan. Kevin Durant and the Oklahoma City Thunder were ready to take the next step, and did (kinda). Could the Celtics maintain their longevity (no), would Derrick Rose and the Bulls step up (hell yes!) and who would be the Cinderella stories (Dallas, Griffin, Memphis, Dirk, Rose, Spurs, the Knicks) and the major disappointments (Orlando, Bosh, Milwaukee, Shaq, Spurs and Knicks again!)?? For most of the season, I kept up, immersed myself. Dissected everything. To a point. ‘The Decision’ (my one this time, not Lebron) came about just at the beginning of the Eastern and Western Conference Finals. This is a tenuous time for any ‘non-single’ (!) human being and requires Kofi Annan-like mediating abilities to enable smooth viewing. It was intimidating and exhausting to contemplate, making time every night for up to two weeks to view an entire game. The match-ups were enticing – Chicago and Miami on one side and Dallas and Oklahoma on the other. Both series ended up being competitive enough (4-1 in both series), but the results were lopsided enough numerically that I didn’t feel like I was missing out. I have read no game recaps, but I know the scores of the games and who won what game in what order. From all accounts, I stepped away from a classic. Not only did one of the better and more beloved players – Dirk and to a significant extent Jason Kidd, and franchises – Dallas, finally get their just desserts, but it came at the hands of the enemy of all basketball fans, the ‘Big 3’, or as Shaq so rightfully called it, ‘The Big 2’ at Miami. I have imagined how I would have reacted seeing this play out – slapping the armrests of my recliner, joyously watching Lebron shrink into himself yet again and high fiving my mates after incredible ball movement saw Dallas players nailing open 3 after open 3. At times, it has been surprisingly freeing (a startling common theme throughout my first month) to ‘step off’ (George Costanza) and be available to people, to make time for the other parts of my life that I want to devote time to. But for the most part, although I wish I could say that I was immersed in other activities, oblivious to what was going on on the other side of the world, that would not be true. Missing those games was really, really hard. Not watching at this very moment players and a franchise that I have admired and respected for years celebrate a fantastic victory is deflating and disappointing. I wish I could have seen it, but I hope that I am setting myself up for something bigger; to make space for people and a realisation that even at the end of a great sports-based night, there is a distinct disconnect between what I am viewing and my own life. The players and I are not mates and in 10 years, they in all likelihood will not care about the club or franchise like I do. I am not bitter about this – I have never set sportspeople up as role models in my own life. If I am able to maintain my friendships (more on that in a later post) and put energy and creativity into developing these without the sporting element as a central part of it, I will be doing ok.
No NBA finals, good Lord man, you are serious! My heart breaks for you, what a series! Miami, dominating through the first 3 games, despite coughing up game 2. Dallas never getting the looks they did against the Lakers until games 5 and 6 after Jason Kidd stated that the shots would come as they wore down the defense over the length of the series. They never lost their cool, unbelievable self belief….but enough about that. I hadn’t watched an NBA finals series since about 2000. Why, I got into Motocross, full on and that was it. No more b’ball. For some reason the interest sparked 1 week prior to Christmas 2010 and I picked up the ball again. I watched about 1 NBA every 10 days and kept abreast of scores via the web. Come finals time, I got league pass to watch online. Loved it! I’ve not seen a football (AFL, not that soccer crap) game all season, and I don’t feel like I’m missing out on anything. When I give it thought, sport takes up very little of my conversation with friends. Yet I play so much of it with friends, while discussing all manner of topics. Mmmmmm, never really thought about that? Is complete disconnection a positive thing? So I know I’m a bit behind the times on this blog, but I’m reading them through one by one with a great deal of interest. I loved what you said in a previous post – something about the repetitive undigested activity that just ‘happens’ leaving us always waiting for the next thing. I really relate to this, and when I think about it in the cold light of day I hate it – really! it’s such a waste of my life, but yet it is so easy to just let myself be entertained by it day in day out. You’ve got me seriously thinking. Also, I liked your statement “If I am able to maintain my friendships and put energy and creativity into developing these without the sporting element as a central part of it, I will be doing ok.” I wonder what I could do with the energy and time I give to keeping up with the AFL happenings? Thanks for your courage and thoughts.